Instead of paying for cable TV, a significant chunk of millennials are getting by just fine on Netflix and Amazon streaming. A new survey from ComScore, cited by Re/code, found that 24 percent of TV viewers ages 18 to 34 don't subscribe to a traditional pay TV service. Nearly 46 percent of those viewers never had cable to begin with, while the rest simply cut the cord. Why this matters: ComScore's survey is hardly the first to show that cord cutting is on the rise. A 2013 survey by Experian, for instance, showed that 12.4 percent of millennials don't subscribe to traditional pay TV services, compared to 7.9 percent in 2010, and that a growing number of those households are relying on streaming services instead. Combined with falling pay TV subscriptions in the United States, it's clear that cord cutting isn't going away, and that the demand for cheaper, more flexible TV services is only going to increase. Surprisingly, costs savings weren't a major factor when ComScore asked people why they watch original shows online. Convenience, fewer commercials, and the ability to watch on their own schedule were all cited more often as the main reason to stream. However, the results would likely look different if the same question was posed only to cord-cutters, rather than all survey respondents. As for what's keeping people tethered to cable, it largely comes down to sports. Among traditional pay TV subscribers, 50 percent said sports were important to their viewing habits, compared to 26 percent for non-subscribers. No other genre showed such a large gap in viewing priorities. ComScore's survey also reinforced the idea that younger viewers are far more likely to watch video on computers, tablets, and smartphones. But traditional TV still reigns, with 83 percent of millennials saying they watched an original TV series on a television in the last month. Netflix was the most popular streaming option among millennials, with 49 percent saying they subscribe to the service. 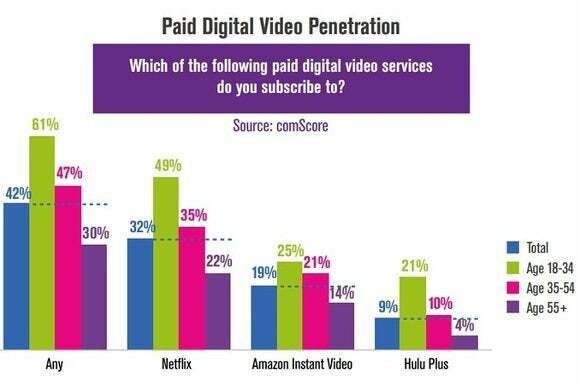 Overall, 32 percent of those surveyed say they have a Netflix subscription, compared to 19 percent for Amazon Instant Video and 9 percent for Hulu Plus.